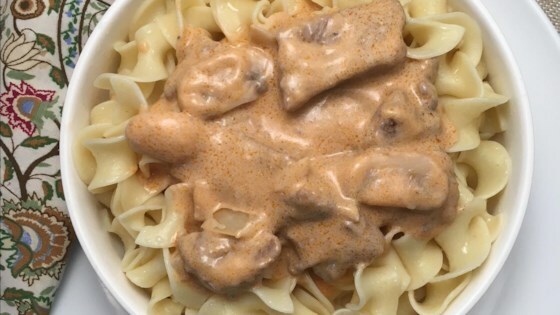 "Being of Norwegian descent, I really don't know how this Russian beef stroganoff came into the family. My grandma has made this recipe for 50 years that I know of and it is truly my favorite. Serve over noodles. For a wintertime comfort food this is the best. I actually like it so much that my wife and I will have this for dinner and the next morning we will eat the leftovers with a couple of eggs on the side for brunch. You can't beat it!" Combine 1 1/2 tablespoons flour with salt and pepper in a bowl. Dredge beef strips in the mixture. Melt 3 tablespoons butter in a skillet over medium heat. Add the dredged beef strips; cook and stir until browned, about 5 minutes. Add mushrooms, onion, and garlic; cook until onion is barely tender, 3 to 4 minutes. Transfer the beef and mushroom mixture to a plate. Melt remaining butter in the same skillet; reduce heat to low. Stir in 3 tablespoons flour and tomato paste; cook until slightly browned, 1 to 2 minutes. Increase heat to medium. Add beef stock slowly, stirring constantly, until gravy is thickened and no lumps remain, 5 to 10 minutes. Return the beef and mushroom mixture to the skillet with the gravy. Stir in sour cream and sherry; heat until bubbling, about 5 minutes. Creme fraiche can be substituted for the sour cream. The kids loved this, however I did not have sherry, so I used 1/2 cup of beer. It still worked well. Will definitely make this again. Wonderfully creamy and delicious. A favorite go too when the wind is howling and the snow is blowing! I've always made it this way. I don't usually have Sherry, so I sometimes use a dry red wine and some Worcestershire. I never use cooking wine or cooking Sherry though.